Why Choose The Gorman Center for Fine Dentistry of North Oaks MN? We believe in delivering the principles of Excellence, Precision, Balance, Perspective, Awareness and Attention to deliver a comfortable and natural approach to North Oaks dentistry. When selecting a dentist for North Oaks Dentistry, experience counts. From implants and veneers to gum tissue health and smile design, we hold the highest standards of excellence as our guide. 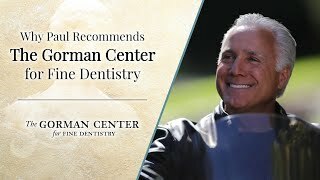 Watch our video and let our extraordinary team tell you why you should make The Gorman Center for Fine Dentistry your dental home. AACD Accredited dentist, Dr. Steve Gorman, has developed a wonderful reputation amongst his peers and is recognized nationally for his smile design and problem-solving ability. Dr. Steve Gorman is trusted by many loyal clients. Your smile will be under the care of an award-winning dentist. Striving to Make You Smile! With a home-like feel and a warm, caring staff, you’ll soon discover why it’s easy to establish long-lasting trust with Dr. Gorman and everyone at The Gorman Center for Fine Dentistry. Find out why Paul wouldn't go anywhere else for dental care. Well, at my age I’ve gone to different dentists and did different experiences, but we came here originally because Dr. Gorman was referred to us or recommended to us as a really good dentist from someone that we’ve known and we just had great care over the years. There’s been a number of times with both myself and my son when we had emergencies and the level of care, just personal care, and then taking care of our teeth is outstanding. We wouldn’t go anywhere else. The Gorman Center for Fine Dentistry’s reputation is built on consistent delivery of dental excellence. Are you ready to experience it?